Thomas Winningham, author of the rtl_fm_python web application for the RTL-SDR has given a talk at the PyOhio 2014 conference. In Thomas’ presentation he gives an overview of the RTL-SDR dongle and then goes on to discuss his RTL-SDR Python library and software. If you are interested in developing your own software for the RTL-SDR this talk may be of interest to you as he discusses several aspects of the code used in his RTL-SDR library. Th0ma5w has released his rtl_fm_python program which is a modification of rtl_fm. The added feature is an API and web interface which allows interaction with a running instance of rtl_fm. 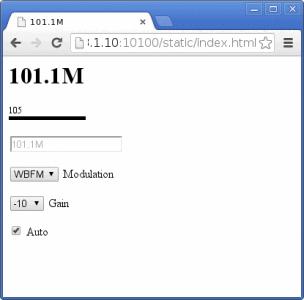 The API and web interface allows you to change the frequency, modulation and gain settings while rtl_fm is running. This may be useful for remote devices running rtl_fm such as a Raspberry Pi.